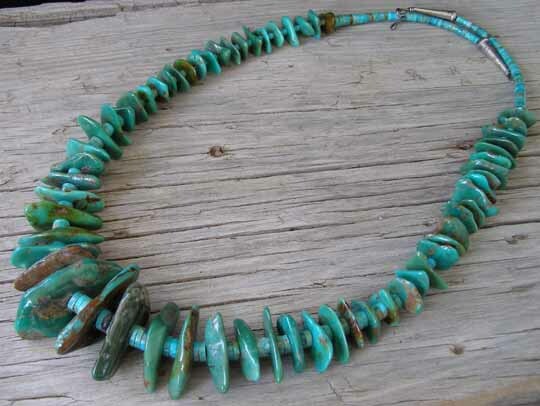 Husband and wife team Joe and Joanne Garcia created this full-length necklace using graduated flat nuggets of Kingman turquoise combined with Kingman turquoise disk beads as spacers. Using the spacer beads prevents these flat nuggets from binding against each other and yielding a stiff necklace. The spacer beads allow the strand to bend and move in a natural way and also separate these large flat nuggets so one can see the beauty of them on all sides. Joe and Joanne made the spacer beads by hand and prepared their nuggets by doing some grinding to smooth rough corners before putting them in a rock tumbler to soften all the edges and get this great polish. After tumbling the nuggets, they were drilled and strung in combination with the spacer beads. The necklace terminates in Sterling beads nestled into Sterling cones at the catch.